I’ll admit that I assumed this tart would turn out awesome (how could it not? ), but the flavors really blew me away. The mint is an uplifting flavor that leaves such a fresh feeling after each bite. Paired with the sweet ripe strawberries and a dash of lemon juice for flavor booster, it makes the perfect summer dessert. So now I’m going to encourage everyone to go out and buy some late-season strawberries and mint (when is mint’s season?) and make yourself this deliciously simple and scrumptious dessert! Better yet, bring it to a party and impress all your friends. Tarts are great because they look so fancy but are ridiculously easy to make! 1. Measure the powdered sugar and shortening into a bowl, beat on low with electric beater until smooth. 2. Add the flour, vanilla extract, and salt. Beat until crumbly. Slightly larger clumps should begin to form, if not add water, a teaspoon at a time, until clumps form. 3. Press the dough into tart pan. I used a 9.5″ pan, but there should be enough dough and filling for an 11″ pan too. 4. Bake for 10-12 minutes. While baking, you may line the crust with parchment paper or foil, and then weigh it down with uncooked rice, beans, or tart weights. Instead of lining and weighting the crust, I just removed the crust from oven halfway through and poked the puffed-up parts down with a fork while it was hot. This is an important step that keeps the tart bottom flat. 1. In a medium bowl mix sugar, flour, and cornstarch together with a fork. Add the water and beat for 2 minutes until thick and creamy. 2. In a saucepan simmer the soy milk. Add 1/2 cup of milk to the sugar mixture and mix until smooth. 3. Add the sugar-milk mixture back to the simmering milk in the saucepan. Whisk constantly until thickened, this will happen pretty quickly. 4. Remove from heat and let cool. Can set aside in fridge until ready for use. 1. Mix sugar and cornstarch together in a saucepan. 2. Add the remaining ingredients and heat over medium heat until clear and thick (about 2 minutes). 3. Pour glaze through a strainer to separate the mint (I used this leftover sweetened mint to make mint tea) and set aside to cool. 1. 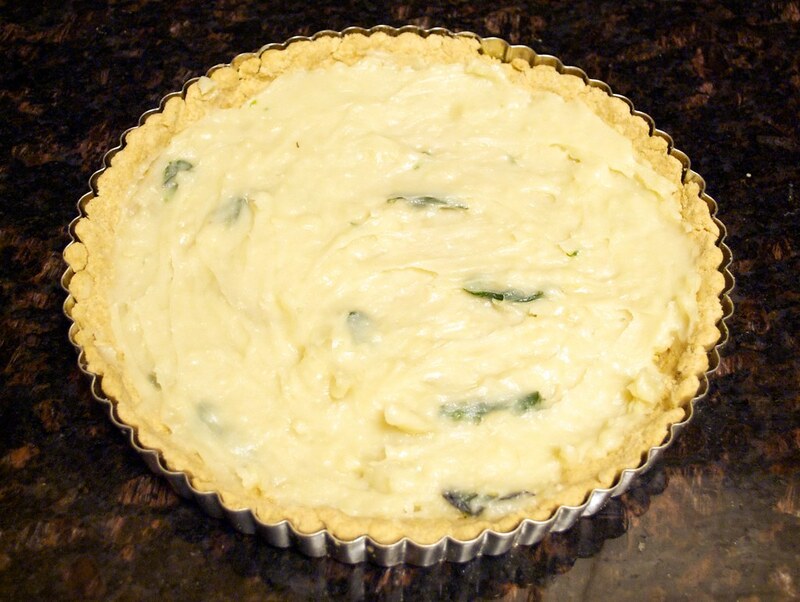 Spread mint cream over the tart base. 2. 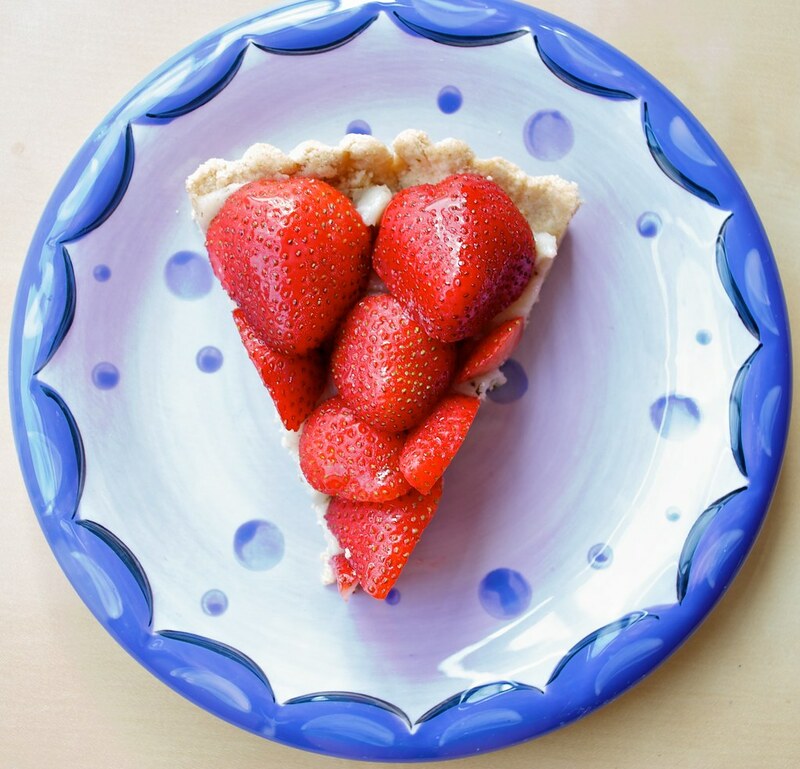 Place a whole strawberry in the center of the tart, and then place the rest of the strawberries around the first one in concentric circles to fill the entire pan. 3. With a pastry brush, cover the strawberries with the mint glaze. Serve room temperature or chilled the next day! 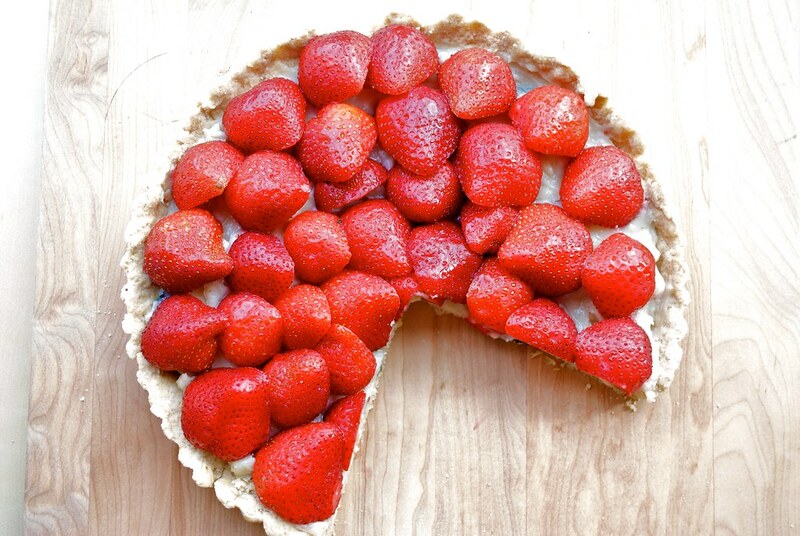 This entry was posted in dessert and tagged food, mint, recipe, strawberries, tart, vegan. Bookmark the permalink. What a wonderful recipe. The perfect way to eat strawberries! Yum! I love mint and strawberry. One of my favorite desserts is just making some strawberry/mint whipped cream and eating it as is 🙂 Your strawberries look so fresh and ripe! Are they from whole foods? NIce combination. I love the colors! This is a very clever idea. Most strawberry pies I have seen in the past have a cooked filling made with strawberries and lots of sugar. This seems much nicer, and no added sugar is what I like. Thanks for the inspiration. Can you substitute butter for vegan shortening? so nice, i really want it.. This recipe looks really good and I’m thinking of making it for dinner tomorrow night. However, I have a question. When making the mint cream, when do you add in the mint and lemon? After the cream is made?